Here is a list of cars compiled by forbes with the support of Vincentric, an auto-industry analysis firm in Bloomfield Hills, Michigan. The $1.4 million Maybach Landaulet is a chauffeur-driven car with a top that can be opened fully at the rear, while the chauffeur's compartment remains completely enclosed. A partition screen with clear glass and curtains dissects the car, and folding tables in the back allow for afternoon Champagne lunches on the go--on reclining white-leather seats, of course. When the weather doesn't allow for such things, there's a Dunhill umbrella stowed in a special slot on the door. If you hate the smell of exhaust or the skunk you just passed on the highway? you should buy the Maybach 62 Zeppelin, your nose will never have to suffer again. The car comes with a built-in, illuminated atomizer that gently diffuses the fragrance of your choice throughout the cabin. 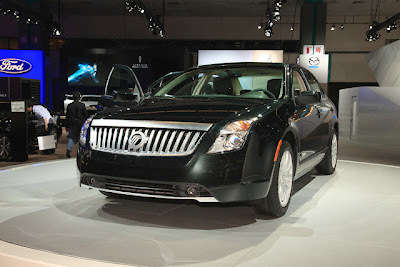 The cost of the car is around $506,500. 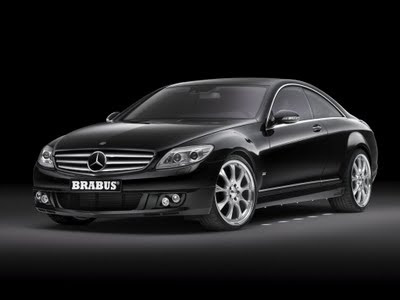 Brabus SV12 R -is going to be the world’s fastest and most powerful luxury sedan. Based on the latest Mercedes S 600 facelift, the SV12 R develops 750 hp and can hit a top speed of 211 mph. In order to obtain the power increase, Brabus added larger turbochargers, a more efficient intercooling system and a stainless-steel high-performance exhaust system with four tailpipes and metal catalysts with low back pressure. As a result the engine delivers 750 hp at 5,500 rpm and a peak torque of 995 lb-ft at 2,100 rpm. The SV12 R sprints from 0 to 60 mph in 4.0 seconds, can hit the 124 mph barrier after just 11.9 seconds and is electronically limited to a top speed of 211 mph. Next to this immense power upgrade, the SV12 R also adds custom-tailored front aluminum sport fenders that replace their production counterparts, an air vent made from clear-coated carbon and a horizontal brace that spans the outlet with embossed BRABUS signet and integrated LED lights, BRABUS rocker panels that feature integrated entrance lights and light-alloy wheels with diameters ranging from 17 to 21 inches. 1.The Chevrolet Corvette ranks high among car enthusiasts for its speed, performance and looks. German car manufacturer Maybach existed for a relatively brief period of time (1921-1941), yet managed to build more than its share of superlative automobiles. Considered a somewhat less flashy rival to Mercedes-Benz, Maybachs still had plenty of style and performance. The 1939 Maybach SW38 Spohn Sport Roadster is one of the most beautiful Maybachs ever, with thoroughly modern technology such as an electrically welded and cruciform-braced chassis, and fully independent coil suspension. Classic cars and vehicles like this were featured at the 2008 Pebble Beach Concours d'Elegance. Bentley is one of the most illustrious names in car history, boasting incredibly successful race cars, as well as classic, luxury touring cars. From this tradition comes the 2009 Bentley Continental GTC Speed. One of Bentley's three high-performance Speed models, the Continental GTC Speed has a 600 hp engine, allowing zero to 60 mph in 4.5 seconds, and a top speed of 200 mph. Two people check out the Smart car on Yonge at Shutter parked behind one of the bigger vehicles on the streets of Toronto, a Hummer. 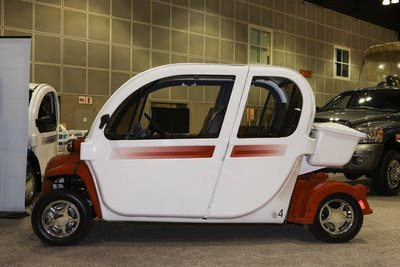 Smart cars are so short that they can even be parked nose in or out to the curb to get into tight spaces. 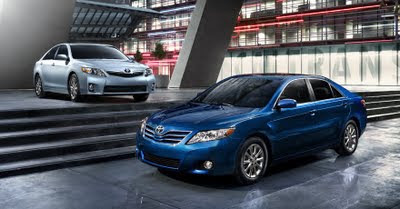 Expect the all-new 2010 Fusion Hybrid and Mercury Milan Hybrids to generate some serious excitement when they go on sale .These highly advanced hybrids boast city mileage figures of 38 mpg or better. Thanks to a highly compact design, the hybrid system has a minimal impact on passenger and luggage space. The instrument panel features SmartGauge, consisting of high-resolution LCD screens that deliver information to the driver to help encourage fuel efficient driving. 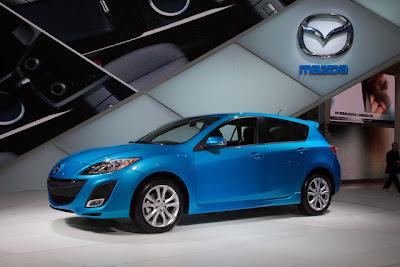 The Mazda3 has always had a devoted following, in part because Mazda has managed to combine spirited (yet refined) performance with exciting styling. 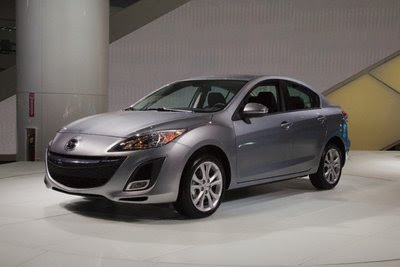 This tradition continues with the new 2010 Mazda3. 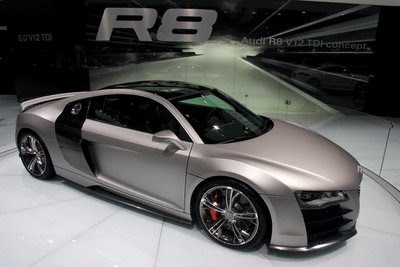 The 2009 Audi R8 5.2 FSI Quattro is an even higher-performance version of its R8 flagship. A 518-horsepower V10 propels this beast to a top speed of 196 mph. A similar version of this engine will power Audi's new $330,000 R8 LMS racing car that's in development for GT3 events in 2009. The 2009 Mercedes-Benz SLR Stirling Moss is named after the famous race car driver who drove to victory in a Mercedes-Benz SLR in the 1955 Mille Miglia. With a 650 hp supercharged V-8 under the hood, this Benz is capable of blistering performance. Cost: Over $1,000,000. 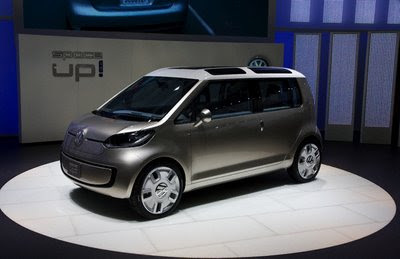 2009 Volkswagen Space Up! 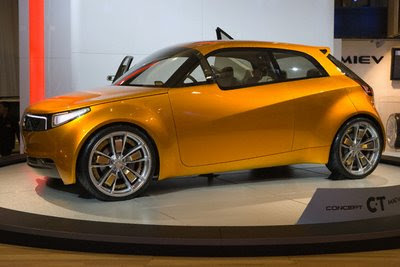 concept car displayed in the Los Angeles auto show. The Audi R8 is a mid-engined sports car introduced by the German automaker Audi in 2007 and based on the Lamborghini Gallardo platrform. 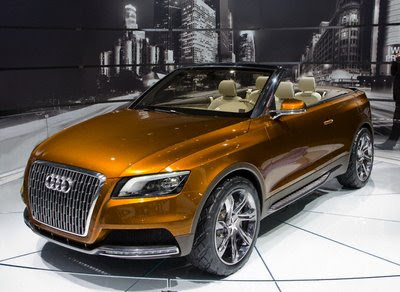 The Cross Cabrio combines the genes of a typical dynamic soft-top convertible from Audi with the all-round qualities of a fully fledged SUV. 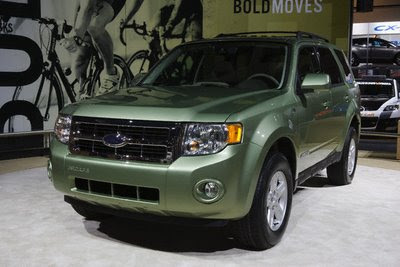 Ford was first to market with a full-size SUV hybrid and this 2008 Ford Escape Hybrid has been fully redesigned. It has SUV capabilities with the increased fuel economy and low environmental impact of its gasoline/electric hybrid system. 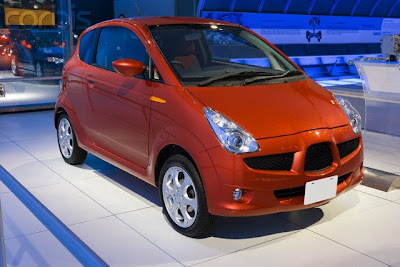 The 2006 Mitsubishi Concept CT Hybrid features the Mitsubishi In-wheel Electric Vehicle (MIEV) hybrid powertrain, which employs an electric motor in each of the vehicle's four wheels. 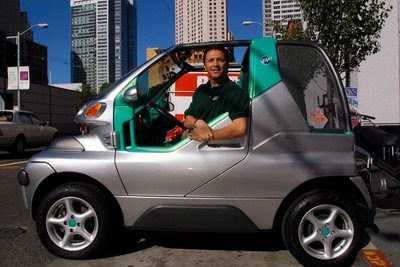 Steve Schneider, CEO of Zero Air Pollution (ZAP), sits in the protoype of a ZAP L.U.V. 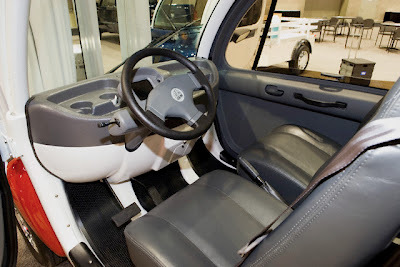 (Light Utility Vehicle) electric car. 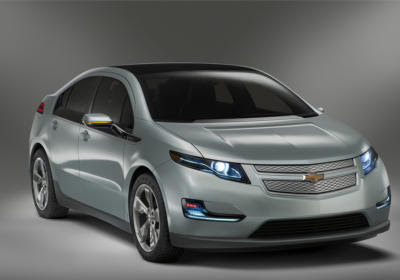 ZAP recently unveiled the new ZAP L.U.V. 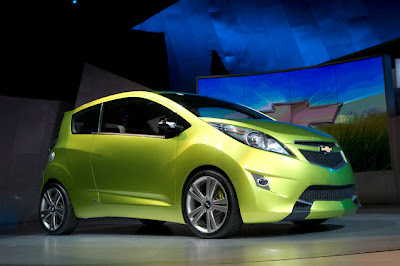 electric car that can travel up to 240 miles at speeds of 70 m.p.h. They sell for between $9,000.00 and $17,000. This state of the art electric Volvo sports car features a body consisting of a single piece of carbon fiber, forming an extremely strong shell. 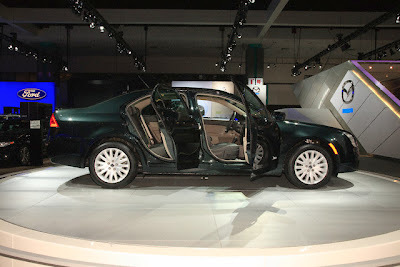 This enhances chassis rigidity and thus handling. Particularly innovative is a unique two-plus-one configuration, providing seating for two adults in the front and a rear seat for an additional adult or two children. 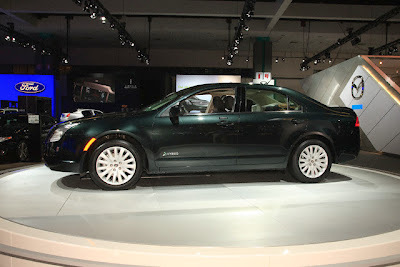 Global Electric Motorcars, LLC (GEM), is a wholly-owned subsidiary of DaimlerChrysler and the leading producer and seller of low speed neighborhood electric vehicles. 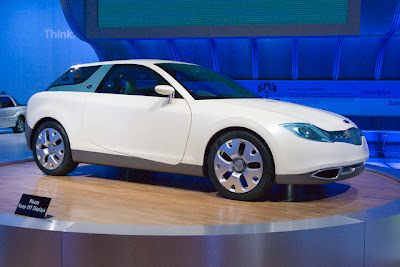 The 2006 Subaru R1 Electric Prototype vehicle is designed for the Japanese market, and is powered with Lithium Ion batteries.